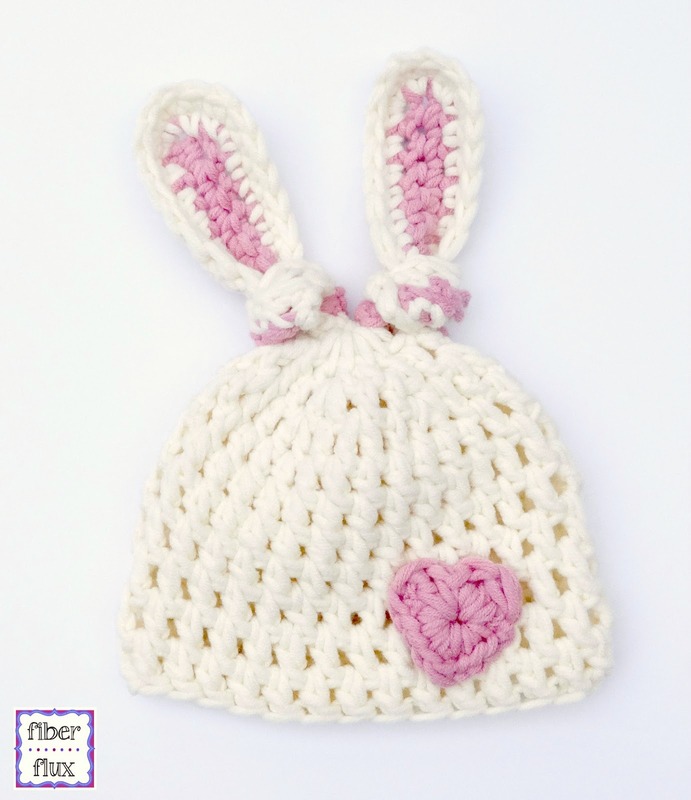 Fiber Flux: Free Crochet Pattern...Newborn Bunny Knot Hat! Free Crochet Pattern...Newborn Bunny Knot Hat! 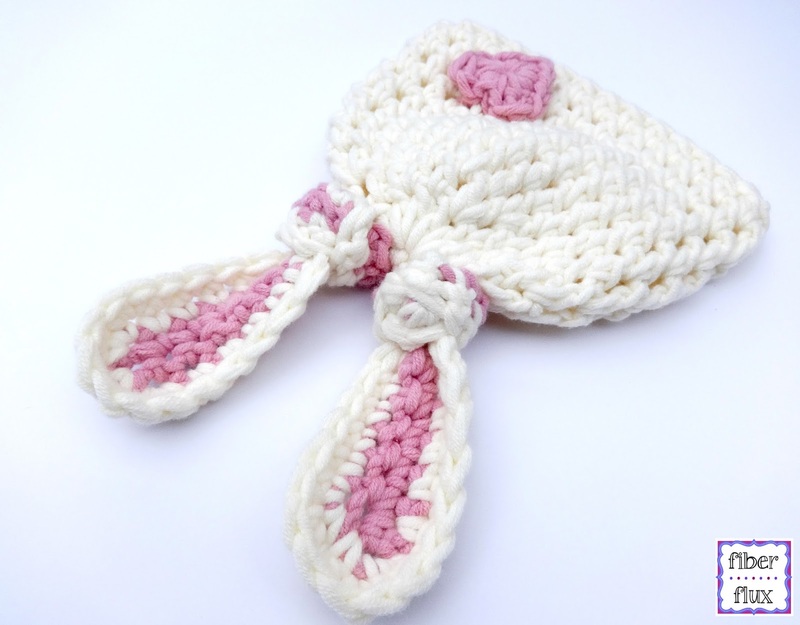 The Newborn Bunny Knot Hat a super sweet hat full of fun! 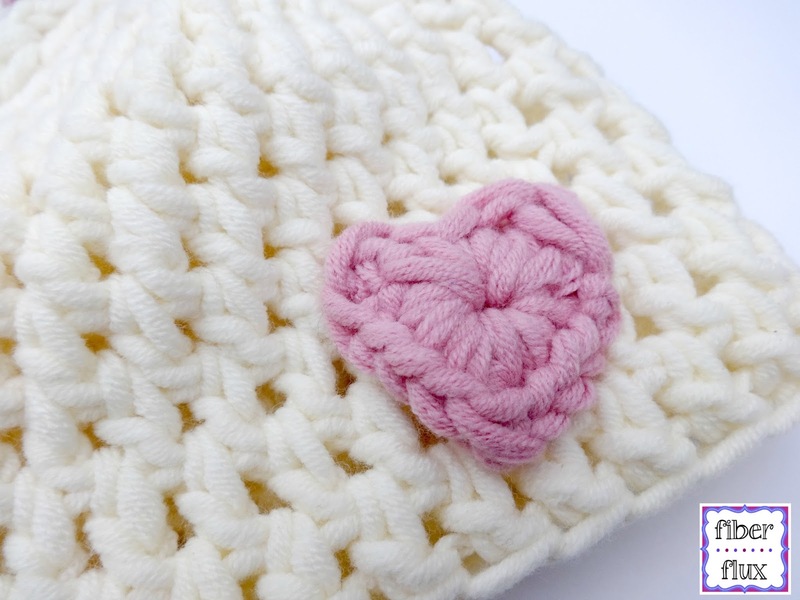 Crocheted in squishy huggable yarn, it is easy to make and keeps the littlest heads warm. Easy to make ears are knotted and a pretty little heart finishes it off. A great one evening project for spring time! Newborn (height 6 inches, circumference 35 cm/14 inches) Hat is stretchy and will grow with baby just a bit too. Note: stitches are worked in the spaces. Click here for a helpful tutorial. Foundation: Ch 4, join with a sl st to form a ring. Round 1: Ch 3, then work 11 dc into the center of the ring, join with a sl st to close round. Round 2: Ch 3, *1 dc in the first space, 2 dc in the next space, rpt from * to end of round. Close round with a sl st. Round 4: Ch 3 (counts as a dc). Skip the first space and work a dc in each space around. Close round with a sl st.
Repeat round 4 until hat measures 6 inches from beginning. Fasten off. Note: Pink part of the ears is worked in rows, cream part is worked in rounds. Beginning with pink yarn, ch 14. Row 1: In the second ch from the hook work a sc. Work a sc in each ch across. Row 2: Ch 1 and turn. 2 sc in the first st, 2 sc in second st, then work a sc in remaining sts. Work a sl st in t-ch and fasten off. Switch to cream yarn and tie into last st worked, then ch 1. Round 1: Work a sc in each stitch until you get to the first corner. Work 2 sc in corner. Continue in this manner, working 1 sc in each st, 2 sc in each remaining corner. Join with a sl st to close rd. Round 2: Repeat round 1, then fasten off leaving an 8 inch tail for sewing onto hat later. Round 1 (work all stitches into the ring): dc, tr, dc, sl st, dc, tr, dc, sc, sc, sc, tr, sc, sc, sc, join to close heart with a sl st and fasten off leaving an 8 inch tail for sewing to hat. Sew both ears to top of hat as shown. Tie a knot at the base of each ear and pull firmly. Alternatively, you could leave ears unknotted and make a flop eared bunny hat. Sew Heart to bottom right side of front of hat. Weave in any ends that remain! when you say "Repeat round 4 until hat measures 6 inches from beginning." do you mean the top of the hat to the base of the hat. or 6 inches in circumference? thank you. i love this pattern, but have no clue how big a new borns noggin is. Hi there, at the end of round 1 after making 11 dc, should you slip stitch to chain 3 or just continue onto round 2? For round four and following: how is chain three a double crochet? I seem to be getting a bulge in my hat when I skip that first space... any suggestions? What do I do if I want to make it a little bigger?